This camera has film in it right this minute, as it has its turn in Operation Thin the Herd. My, but do I like this camera. My, but do I not need this camera. Anyway, I’ve refreshed its review, and you can read it here. Happy 20th birthday to my son, Garrett! 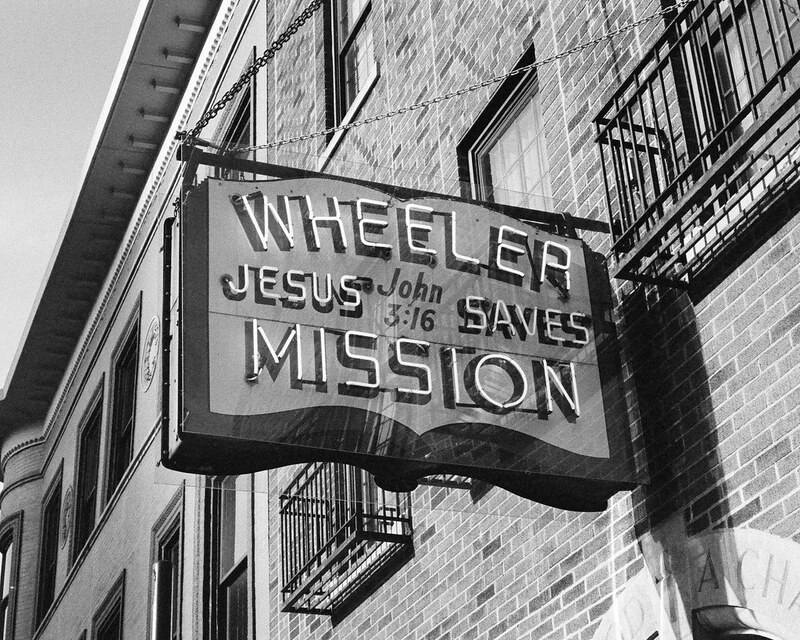 A famous neon sign in downtown Indianapolis. Until the late 1970s, Nikon-branded 35mm SLR cameras were designed, built, and priced for pro photographers. But Nikon figured amateurs would buy SLRs, too, if they were priced right. But Nikon feared diluting their brand, and so gave consumer cameras other names. 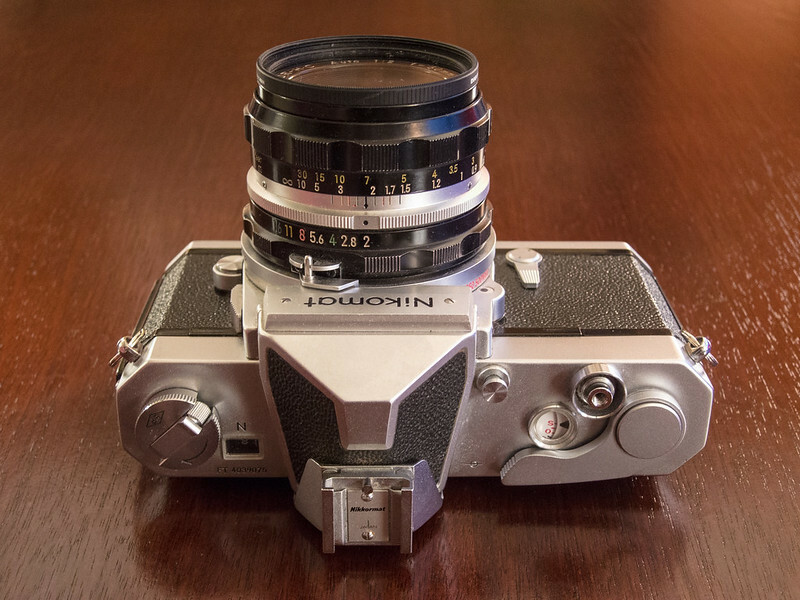 Nikon’s first go, 1960’s Nikkorex, never caught on. Nikon simply guessed wrong at what features amateurs wanted. Moreover, Nikon outsourced manufacture, and whispers of reliability problems hurt sales. So Nikon tried again with an all-new camera built in Nikon factories. The Nikomat (in Japan, Nikkormat in the rest of the world) was born, starting with the 1965 Nikomat FT. Recently, a Japanese Nikomat was generously donated to the Jim Grey Home for Wayward Cameras. It’s this 1967-1975 Nikomat FTn. Consumer SLR photographers, it turned out, wanted through-the-lens metering, fast shutters, and interchangeable lenses. The Nikomat/Nikkormat line obliged, and could take the entire range of Nikkor lenses that were designed for Nikon’s professional F-series cameras. But the Nikomats lack the F’s interchangeable viewfinders and focusing screens, and can’t take motor drives. Also, there’s no hot shoe. A clip-on accessory shoe was available, though, and a flash can be plugged into M (flashbulb) or X (electronic flash) terminals. 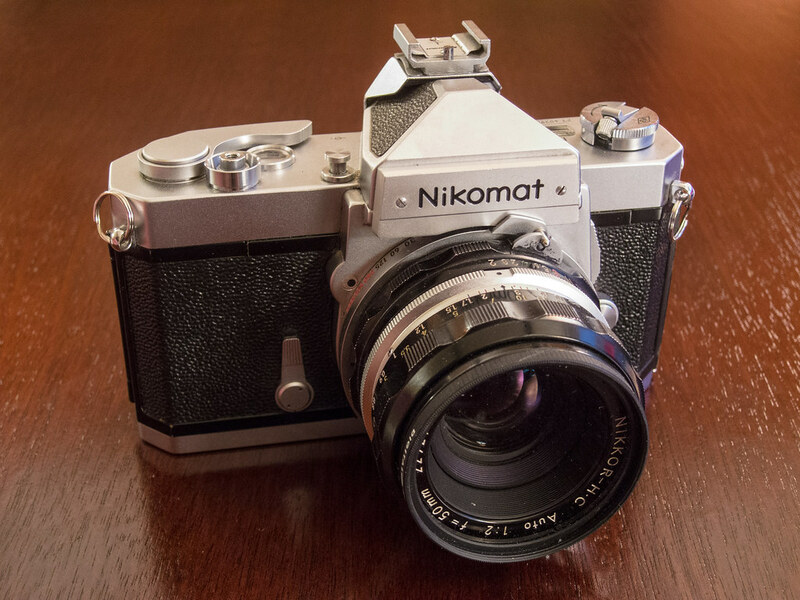 But much like the venerable F, the Nikomat FTn is built like a tank. It feels more substantial than either of my Nikon F2s. It boasts a mechanical vertical focal-plane shutter with speeds from 1 to 1/1000 second. You set shutter speed on the lens barrel, and the speed is visible in the viewfinder. It also features center-weighted average through-the-lens metering. Pull the wind lever back a little to activate the meter, and then adjust shutter speed and aperture until the needle in the viewfinder is between the + and – symbols. Alternatively, you can use the meter display on the top plate next to the rewind lever. Adjust exposure until the meter is centered in the o symbol. The FTn also offers depth-of-field preview and mirror lockup. It takes film from 12 to 1600 ASA. A dreaded, banned 625 mercury battery required to run the meter. Fortunately, everything else about the FTn functions without a battery. I substituted an alkaline 625 cell. To heck with everybody who says this will result in misexposures. As you’ll see, it wasn’t an issue at all. If you’re into metal, mechanical Nikons, also check out my reviews of the F2 (here) and F3 (here). You might also like my review of the Nikkormat EL (here), the Nikon FA (here), and the Nikon N2000 (here). You can check out all of my camera reviews here. I usually test a new-to-me camera with inexpensive color film. But some cameras, this Nikomat among them, feel like they want to be tested with black-and-white film. 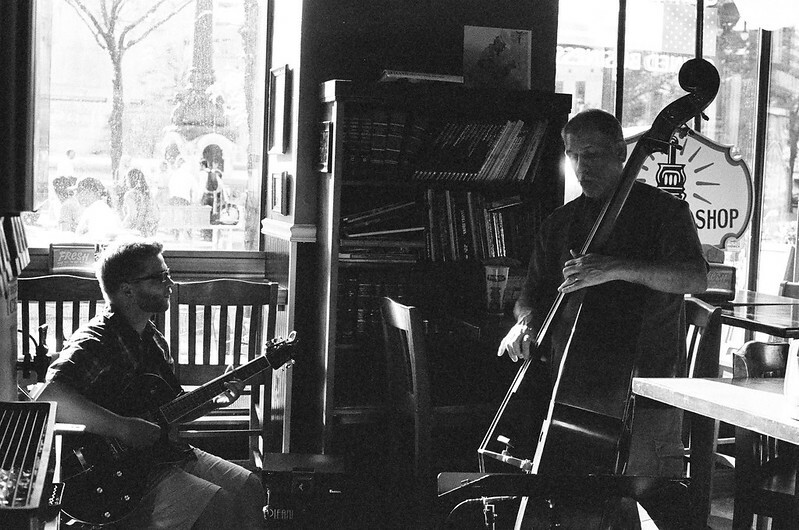 So I loaded my next-to-last roll of dear, departed Arista Premium 400 and took this camera out and about. I used the 50mm f/2 Nikkor H-C lens that came with the camera. And oh. my. gosh. what results I got. My sons and I went Downtown to Monument Circle for dinner at Potbelly’s, my older son’s favorite place. 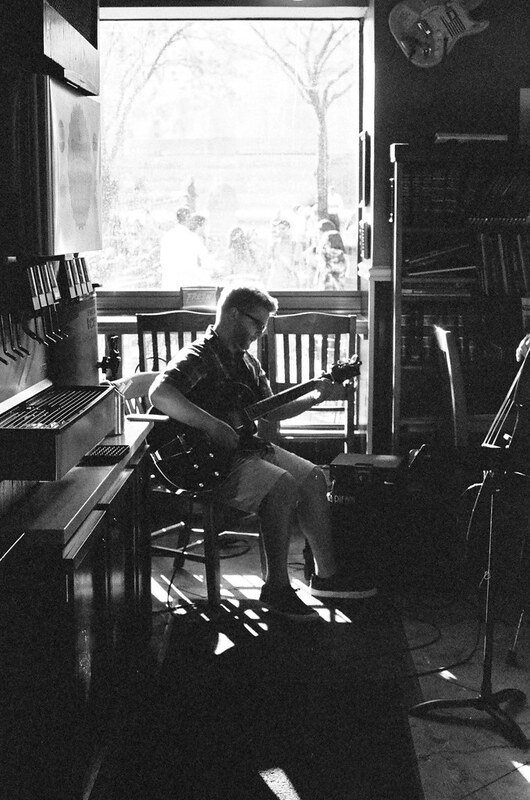 This duo provided a little live music, right next to the soda dispenser. I stepped back a little for this lonely shot of the guitarist. The FTn’s focusing screen offers only a microprism, which makes out-of-focus images look jagged. My middle-aged eyes prefer split-image focusing, but I managed to get focus right in every shot with the FTn. 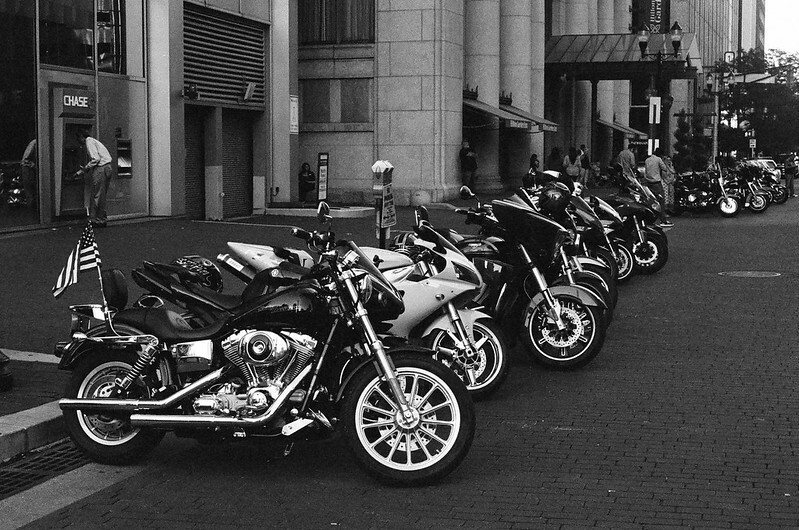 Monument Circle was packed to the gills with people and motorcycles that evening. It was some sort of big biker event. It clogged up Downtown; the closest parking we could find was about five blocks away. But the extra walking didn’t matter, because we wanted to walk around Downtown anyway. We walked along Massachusetts Avenue, one of Indy’s four diagonal streets. 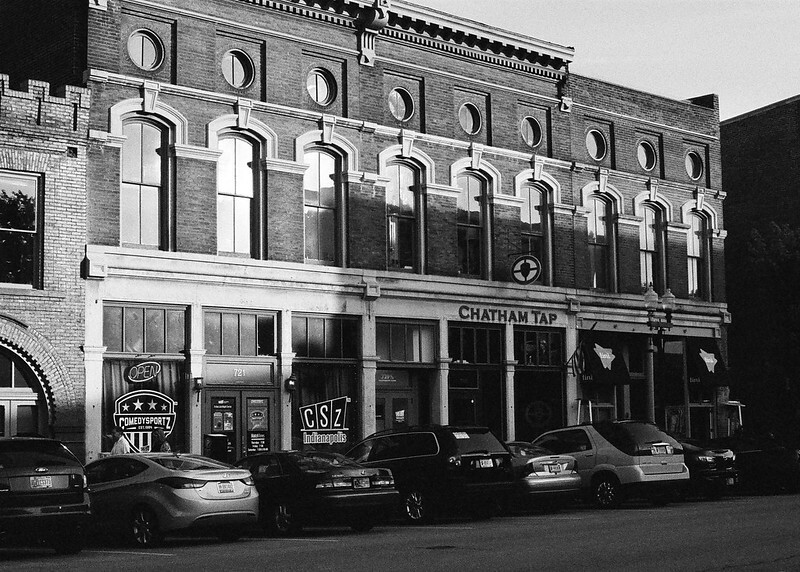 It’s become quite the night spot in the past ten years or so. 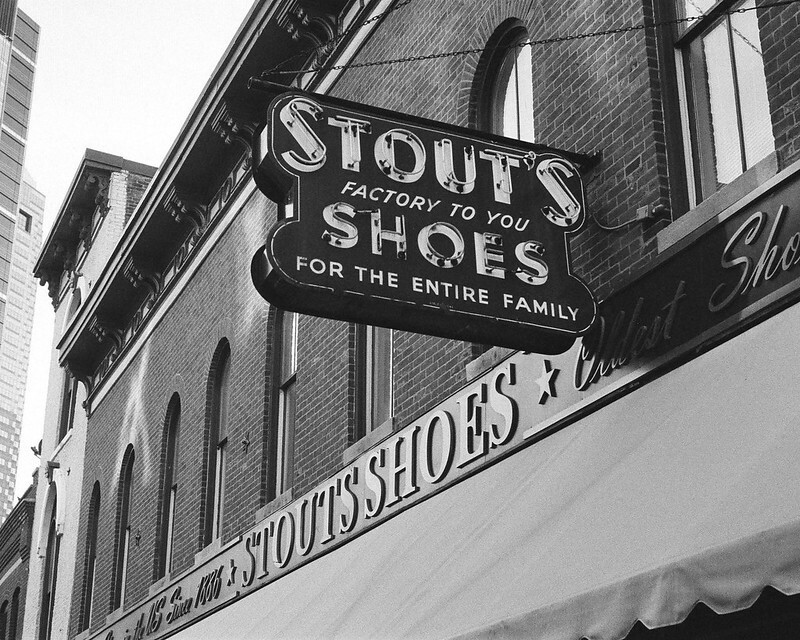 Stout’s Shoes is one of the last regular retailers remaining here. It’s the oldest shoe store in America. My brother lives a couple blocks off “Mass Ave,” as we all call it. I’m kind of jealous, because whenever he gets an itch to get out, he can just walk a little to reach any number of great watering holes. I brought the FTn along when Margaret and I surveyed the wayfinding signs along the Michigan Road in Marion and Shelby Counties. 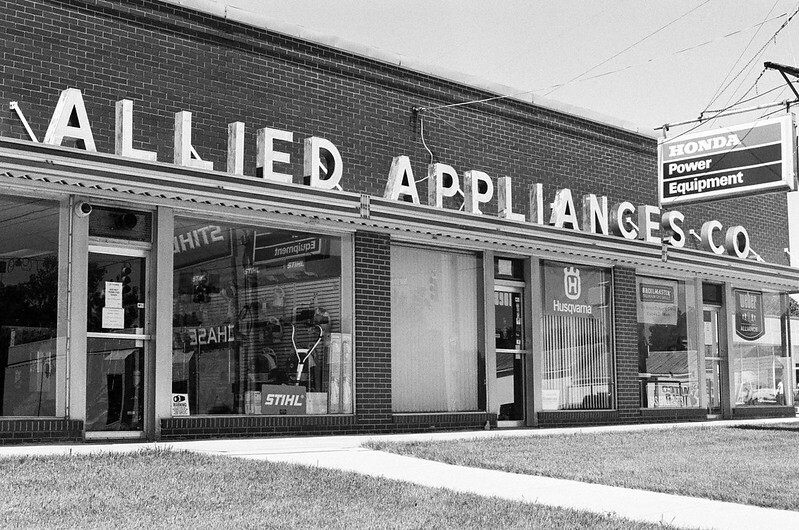 The Allied Appliances storefront in Wanamaker is a real throwback, and clearly it gets regular love to stay looking this good. We lingered in Founder’s Cemetery at Wanamaker’s southern outskirts. 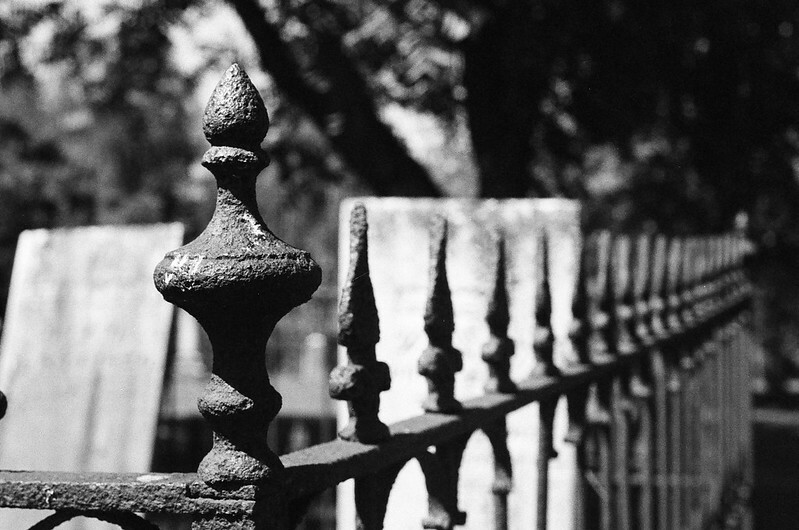 A few gravestones are fenced off. I moved in close to one of the posts and got this great shot. It was a blisteringly bright day, the kind that makes some of my cameras struggle. But the Nikomat handled the light with aplomb. 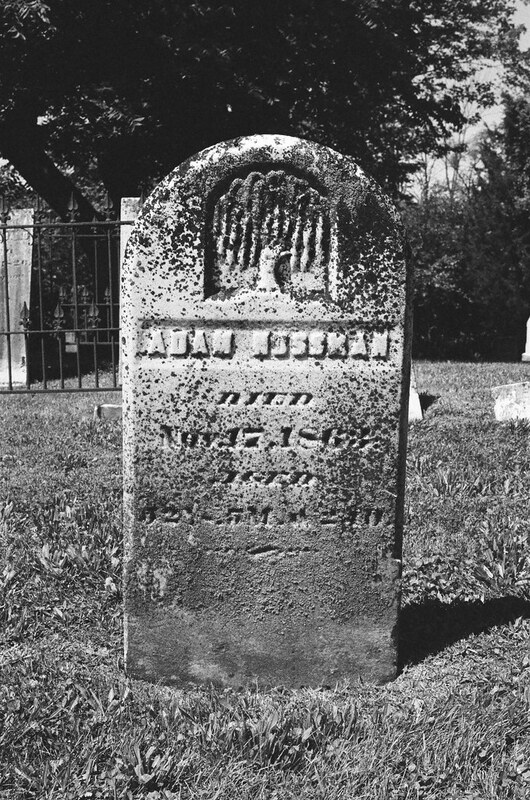 I don’t know who Adam Nossman was, but this photo of his gravestone turned out fine. I took the FTn on one of my three (!) 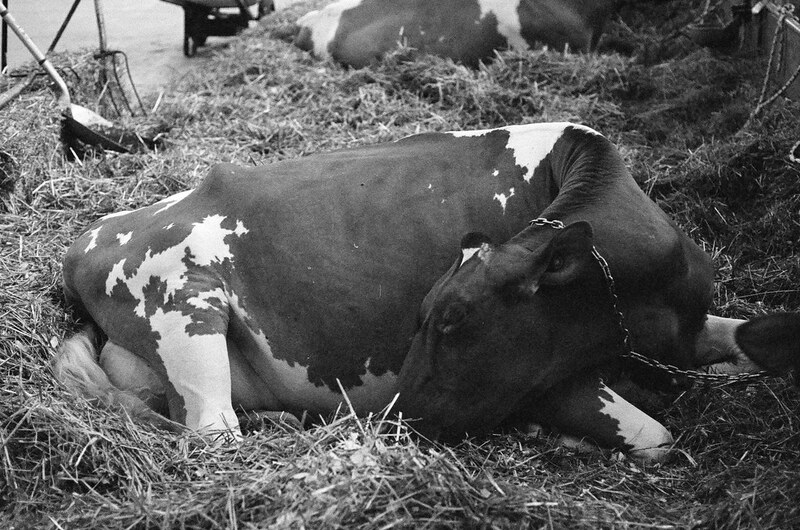 trips to the Indiana State Fair this year, which is where I finished the roll. To see more photos from this camera, click here to see my Nikomat FTn gallery. There’s a stiffness about all of the 1960s 35mm SLRs I own, this Nikomat FTn included. Maybe they all need a cleaning, lube, and adjustment. Maybe they’re just built that way. Who knows. 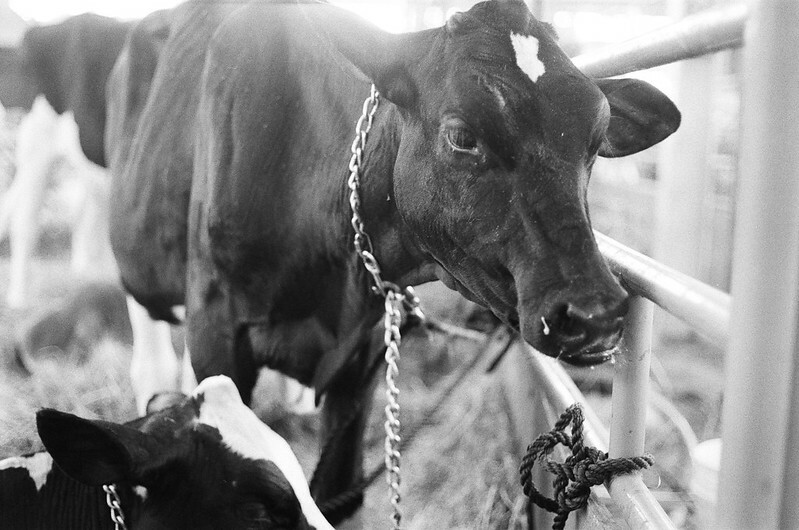 Truth is, my 1970s and 1980s SLRs work much more fluidly and are slightly more pleasant for me to use. But this Nikomat FTn wasn’t so stiff as to be unpleasant, and these outstanding results make me want to shoot it again and again.